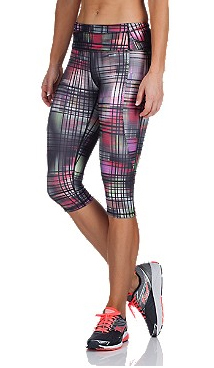 These Saucony Fast Track Capris will make you want to move and they’re comfortable enough to wear all the time. The wide waistband sits smooth and the smart seams won’t chafe. Saucony's taken what we know about what happens to a body in motion to the next level with a collection that made to workout, hang out or go out. The fabrics are pure luxury, while the underlying functional details are pure performance. Lessons learned on the run, brought stylishly to life.